Despite speculation that Uga VI, Georgia's beloved mascot, would not be able to answer the bell for Bulldog games this fall, the pure white English bulldog will be ready for Georgia's home opener Sept. 1 against Oklahoma State. "His biggest problem is he's fat like his daddy. But otherwise he's fine," owner Sonny Seiler told Chip Towers of the Atlanta Journal-Constitution. 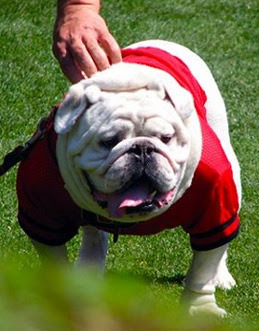 Uga VI just turned 9, and only Uga I (1956-66) served as a mascot past his 10th birthday. "He's no spring chicken," Seiler said. "We can't run him anymore. But he still does his thing, which is mostly eat, sleep and poop."